Bollywood actress Nagma was angered upon by a cheap remark made by one of the Congress advocates in Bijnaur. The remark was made by a man named qamaruddin during a election rally and while he mentioned of supporting Rahul Gandhi,he made along with a cheap remark upon which Nagma was blatantly angered. Nagma had come here as part of the Congress party's election campaign, and Hussain was constantly trying to come close to her. The actor wanted him to be kept at arm's length, but the man was eager to garland her, and in doing so his fingers, deliberately or otherwise, touched her shoulder. And what happened on the dais went totally against the script. Nagma gave him a severe tongue-lashing. 'Aap itne naaraaz na hon'....'Aap bakwaas karne aaye hain'...'Nahin, main bakwaas nahin kar raha hoon', were some of the verbal arrows aimed at each other. 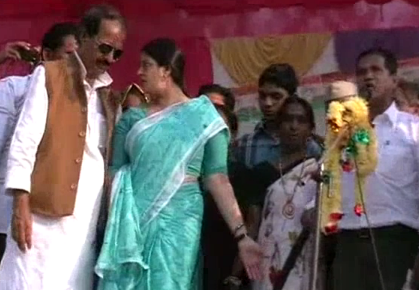 Nagma firmly objected to this cheap shero-shayri and finally left the venue in a huff. Now, over to the voter for the final verdict.